Clusterin Antibody is affinity chromatography purified via peptide column. Clusterin antibody was raised recombinant human Clusterin isoform 1. Clusterin Antibody is supplied in PBS containing 0.02% sodium azide. Clusterin antibody can be stored at 4 degree C for three months and -20 degree C, stable for up to one year. As with all antibodies care should be taken to avoid repeated freeze thaw cycles. Antibodies should not be exposed to prolonged high temperatures. Small volumes of anti-CLU antibody vial(s) may occasionally become entrapped in the seal of the product vial during shipment and storage. If necessary, briefly centrifuge the vial on a tabletop centrifuge to dislodge any liquid in the container`s cap. Certain products may require to ship with dry ice and additional dry ice fee may apply. Clusterin Antibody: Clusterin, also known as Apolipoprotein J (ApoJ), is a ubiquitous multifunctional glycoprotein that can interact with a broad spectrum of molecules such as complement components, various receptors, and the Alzheimer's b-amyloid peptide. Clusterin expression is increased in Alzheimer's disease brain tissue and clusterin-immunoreactive amyloid plaques are found associated with phospho-tau-positive dystrophic neurites and it has been suggested that clusterin facilitates the conversion of diffuse b-amyloid deposits into amyloid and enhances tau phosphorylation in neurites around these plaques. Other reports show that clusterin expression is decreased in proliferating cells and is upregulated in quiescent and senescent cells, suggesting that it may also play a role in aging and tumorigenesis suppression. Clusterin exists in at least two distinct isoforms. 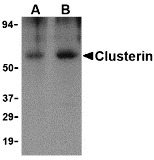 Clusterin antibody can be used for the detection of Clusterin by Western blot at 0.5 - 1 mug/mL. Antibody can also be used for immunohistochemistry starting at 10 mug/mL. Western blot analysis of Clusterin in human brain tissue lysate with Clusterin body at (A) 0.5 and (B) 1 μg/mL. 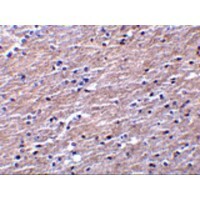 Immunohistochemistry of Clusterin in human brain tissue with Clusterin antibody at 10 μg/mL. 1. Results show that that nuclear CLU expression is regulated by direct binding of HIF-1alpha to hypoxia response elements sites and is epigenetically controlled by methylation of its promoter region.